Buccaneers, Bounty & Boom! is a turn based board game. Take your treachery and backstabbing aboard a goblin pirate ship and set sail on the high seas. When the cutthroat worlds of piracy and goblins clash, the result is an underhanded race of skullduggery to be crowned the Goblin Pirate King. Hire Buccaneers, amass Bounty, and build cannons to Boom! your opponents out of the water. Build up your Goblin cities to harvest the rare bounties of the pirate islands. Deck out your ships with the most underhanded Goblin crew. Stack your cities and ships with cannons and armour to blast your enemies from the seas! 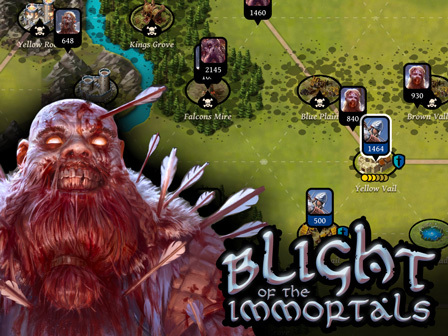 Blight of the Immortals is a very slow real-time online strategy game. Players login throughout the day to command armies of fantasy creatures in a desperate war against the undead. Blight is a cooperative game where all players work together against the zombies. Players must coordinate where to send their armies and how to spend their limited resources. When the last zombie is laid to rest, all players reap the rewards. Neptune's Pride is a slow real-time strategy game. It has has simple rules like a boardgame, but it's online making it easy to play against your friends and family. You log in a few times a day to command you empire and conspire with the other players. Games can last weeks or months as your ships travel in real time from star to star, waging war and expanding your empire. Neptune's Pride is all about player diplomacy. You can't win without allies, but who can you trust and how long will your friendship last? 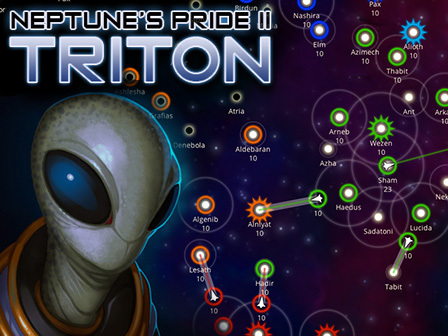 Neptune's Pride was a huge hit in 2010 and received many awards including Web Game of the year from PC Gamer, runner up to Best Independent Game from Edge Magazine. We were also received an honourable mention for the Grand Prize in the IGF. Jay Kyburz has been making video games for over 15 years as an Artist, Designer, Producer and Programmer. Before starting Iron Helmet, Jay was a member of the Irrational Games team where he worked on a huge range of exciting games such as Freedom Force, Tribes, Swat 4, and Bioshock. Penny Sweetser is veteran of 2K Games and The Creative Assembly. Her credits include XCOM, Bioshock 2 and the Total War Games. Penny has a Ph.D. in games development and published a book in 2007 on Emergence in Games. All Rights Reserved, Copyright © 2014. Read what they say about us in the Press!